Craig Explains the Universe: Episode 9 - Did you bring me a monkey? Last week of the regular season, and most everything is wrapped up. Only a few spots are still up in the air with the Jags and Colts both alive for the AFC South, the Packers, Giants, and Buccaneers all alive for a wildcard spot, and of course the NFC Worst championship game in Seattle on Sunday night. Other than that, most of this week is about positioning. This is a tough week to pick, as unlike most every week of the NFL season, not every team is playing with the same motivation, and this disparate effort level combined with having virtually zero idea of who is going to try until the games get started makes this week a minefield. Surely within three minutes of the games starting, I'll feel silly about six or seven of my picks at least. 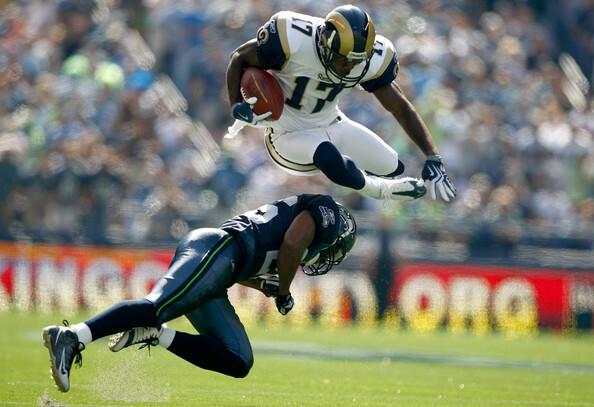 Combine that with me hurtling back to earth with a 9-7 effort last week, and my confidence is shaky. However, the silver lining to this is that I picked my third perfect score of the season last week, nailing the Ravens 20-10 win over Cleveland. So, here goes my best guesses for the Week 17 slate. Enjoy it, folks, after this weekend we only have 11 more meaningful games before the curtain sets on NFL football, and with a lockout looming, I can't guarantee when it'll be back. I am going to dismiss breaking down this game in any meaningful way very shortly, so let me first say that if this is the final time we see Champ Bailey in Broncos orange and blue, thanks for the memories, sir. 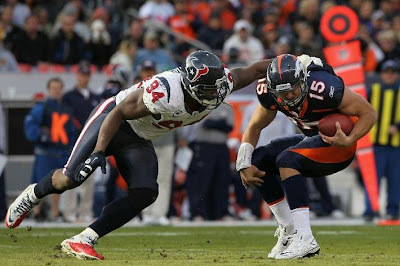 As to a quick recap of non-rookie quarterback news, quickly…the Broncos defense is atrocious, the Texans kicker is deadly accurate from long range, and the Broncos are lucky to have won. However, they did win, and the rest of this “recap” column is going to focus on the only thing that matters in Denver football right now. 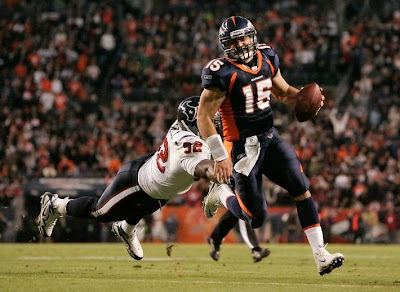 Tim Tebow. Immediately upon dismissing Josh McDaniels, Tim Tebow immediately become the only question the Broncos needed to try and get some answers on with what remained of this nightmarish season. Foolishly, Eric Studesville started Kyle Orton in Arizona, and kept him in despite getting rolled. Fortunately he came to his senses, or more likely someone above him stepped in and said, “Let’s see the Florida kid.” And since that disaster in the desert, we’re are beginning to learn a bit about the quarterback McDaniels spent too much to obtain. I, myself, was driving down I-70 in Western Kansas the whole game, so I merely listened on the radio. However, I was encouraged by what I heard. A team with nothing to play for rallied for no reason other than pride to give a downtrodden fan base a reason to cheer, and that team was led by a quarterback making his second ever start. The actual end result of the game was probably more a matter of luck and fortuitous scheduling than it was a result of Tebow bending the game to his will, but allow us to play with the narrative a bit. The Texans are an emotionally brittle group who will likely be looking for a new coach this time next week. They are shell shocked from the myriad of exciting ways they have found to lose close games this year, and if any team is going to fold when the going gets tough on the road, Houston is a prime candidate. Truth be told if not for a lucky bounce at the line of scrimmage causing the ball to soar directly into the waiting arms of Syd’Quan Thompson, effectively ending the game in the Broncos favor, quite likely the Texans would have at worst kicked a field goal as time expired to send Denver to it’s sixth straight loss. This is often a game of crazy bounces, though, and thanks to that happy deflection, the Broncos pulled out a glorious win; one that the Denver fan base has not been treated to very often this season. 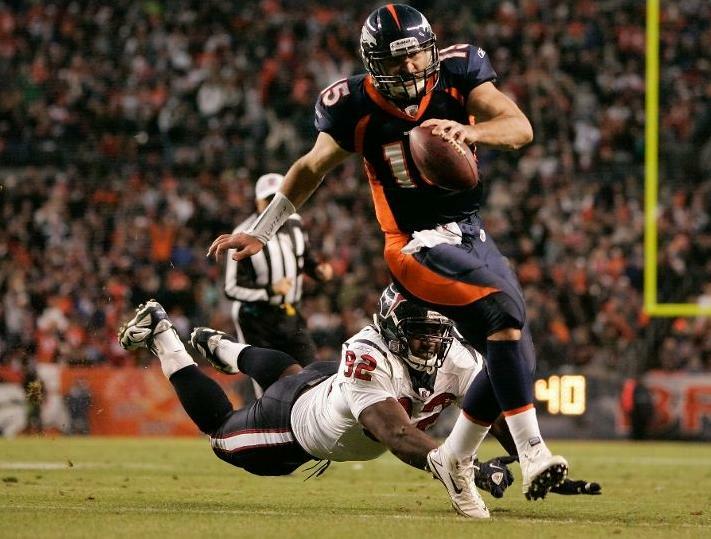 The optimist in me says this is John Elway 2: The Comeback Kid! There was something about the way his personality and enthusiasm took over the game, rallying from three scores down in the second half to generate a win from the ashes of a burned out season. This is a sign of things to come. 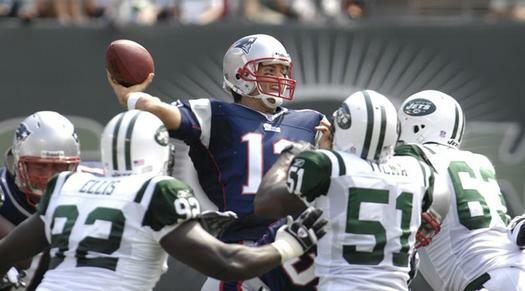 Timmy will lead us, and we will gladly follow to Super Bowl rings and glory. The man is a leader, and a winner, and despite his awkward throwing motion, he routinely makes things happen when he gets a chance. This is the side of me that wants to run out and purchase a #15 jersey in both orange and navy blue so I can wear one while the other is in the wash.
Then there is the pessimist in me. (Or as he would call himself, “The Realist.”) The NFL has only seen him a handful of times, and defensive coordinators are now in their labs cooking up ways to stop him. Despite positive signs, the fact is that he most definitely has the training wheels on, and the coaches are not ready for him to open things up, because he is not ready himself. Also, most people felt like it was a gigantic reach by Denver to grab Tebow in the first round, and there was likely a reason that was the case. His throwing motion is the polar opposite of textbook, and there are significant and legitimate questions to whether or not he’s going to get himself killed running around as much as he does. I don’t know what to think. Part of me says the kid is legit, part of me says he’ll never make it. All I know is that when I watch (or listen) to the Broncos on Sunday, they are more interesting with the kid playing quarterback. His stats were decent yesterday. Not great, but very respectable. 16-29 for 308 yards, 1 touchdown, 1 interception. Add in the 27 rushing yards and a rushing touchdown, and that is a pretty good day even before you factor in that he did it in dramatic fashion, engineering a 4th quarter come from behind victory from a 17 point first half deficit. I enjoy cheering for the kid, and I can’t possibly wish him any more luck than I already am hoping for him. 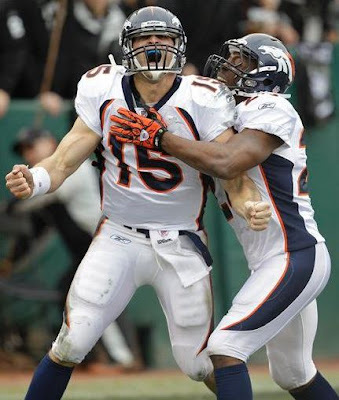 The games are more exciting when he is in, and there is a nervous energy in the air when he walks into the huddle as if the entire city of Denver is a high school girl, and Tebow is the captain of the football team that is showing her some love. There is a giddy love affair in Denver right now with this kid. It is more than slightly irrational, and it may just be puppy love, but the whole city is hoping that it turns into a long and meaningful relationship, and who am I to go against that? Go Broncos, and Go Tebow! Hopefully, this can be start of a beautiful friendship, if not…we’ll always have the Texans game. Uncle. 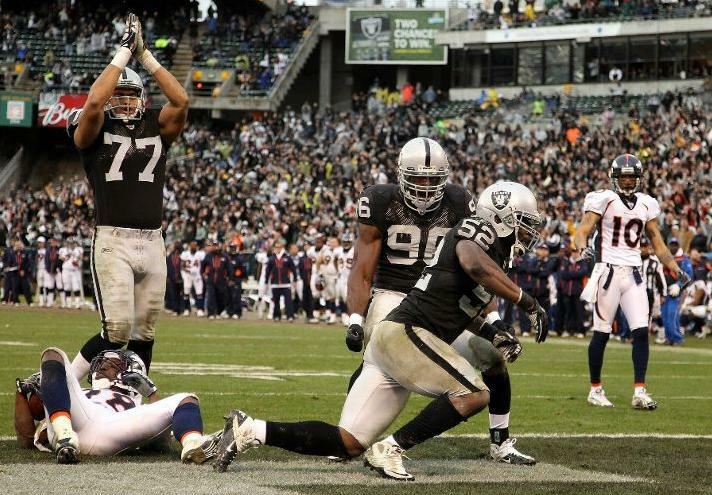 Thankfully, the Broncos don't need to face the Raiders again this year. For those not counting at home, with the 39-23 drubbing that Oakland put on Denver yesterday, the Raiders have now hung 98 points on the Broncos this year. 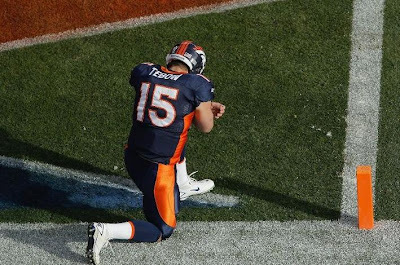 We got to see Tim Tebow, and he looked confidence inspiring. Then you look at his stats, and you realize that no matter how encouraging he might have made you feel, the dude completed only 50% of his passes and for only 138 yards. 8 completions is not going to win very often in the NFL, and it didn't yesterday. Of course, 78 yards rushing helps, too. 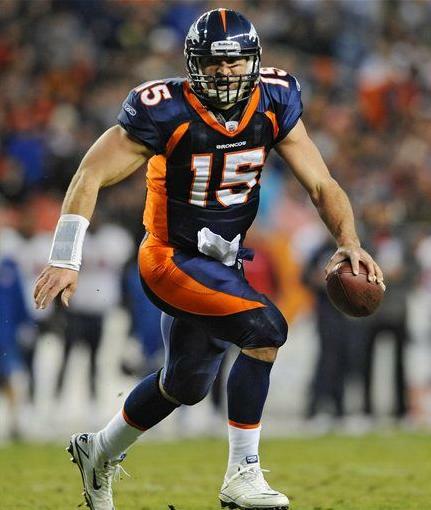 Tebow did almost as much damage with his legs a including a 40 yard scamper up the middle that was very reminiscent of the form which won him a Heisman at Florida. Unlike almost every game he played at Florida, though, Tebow's team was less talented than the opponent, and lost. 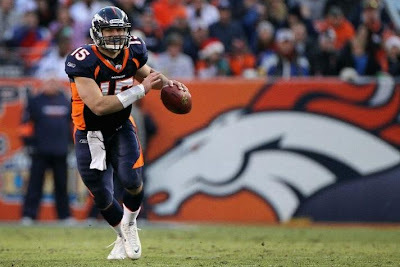 It was an odd feeling watching Tebow, as his truly does carry himself with confidence and yet it's obvious the coaching staff has zero confidence in him. The handcuffs were on, and it was painfully obvious they trust him to do too much. However, when he was allowed to toss the ball, although his delivery looks weird, it looks good in the air. His accuracy was much higher than I was expecting, and after the game, I felt like he might have a shot. 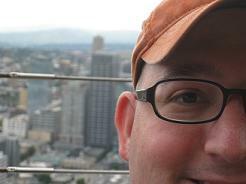 Actually, the game in Oakland was almost exactly what I wanted. Tebow looked good (not great, but good. ), the Broncos played tough and hung with Oakland for awhile, and most importantly...they didn't hurt their draft position by winning a meaningless game. It's strange having your team have nothing to play for. As the game is going on, I am cheering for them to win, but as soon as it's over I'm almost relieved they lost. The fact is, this is a team that was plus two in turnovers, got decent production from a rookie quarterback in his first start, and still lost by sixteen points. 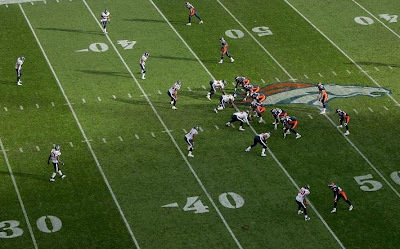 The defense looked foolish on several occasions, allowing a fullback to scamper 73 yards on a basic screen play and giving up a 71 yard touchdown on a reverse on the game's first play. 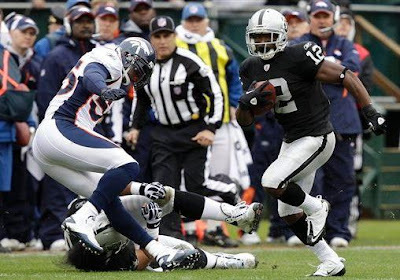 The Raiders more than doubled the Broncos total offense, gaining an obscene 502 total yards. (Add that to the 508 from the first game, and the Raiders gained 1010 yards of total offense against the Broncos this season, Egad.) Then, just to make sure the Raiders scored just about every possible way, they got a safety. So, the Broncos are bringing up the rear of the NFL, as right now, I'm not sure there is anyone they could beat. We could wallow in sadness about it, or believe that there is no way to go but up from here, right? (They can't possibly get WORSE, can they?) The rebuilding may take a few years, or it could take less than that, as this is the NFL and teams do rebound often to get good quickly. For now, let all Broncos fans take comfort in the fact that this particular edition of the Broncos can only shame us two more times before we get an offseason to try and heal a little bit. Have a Merry Christmas, and Go Broncos. Twas the week before Christmas, and Craig's mom just got an iPhone which had his world in a bit of a tizzy. He recovered enough to talk through all sorts of issues with Face Ventura and The Whale. Together they carded some wankers for their wankerish behavior, discussed a potential Blogtalk radio co-op, provided the listeners with some wonderful Christmas gift ideas, and held the 4th Edition of the He-Man movie watchers club where sadly, they discussed D2: The Mighty Ducks. Such a terrible, terrible movie. 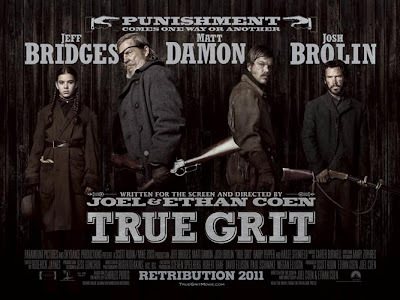 The show finished up with the movie recommendation: Needtobreathe's great song, "More Time." No show next week, due to Christmas. We'll see ya in 2011. Another 13-3 week for me last week, plus I had the Eagles-Cowboys game picked exactly. I said 30-27 Philly, and that is how it ended. I'm feeling proud of myself, but sad that there are only three more regular season football weekends remaining. 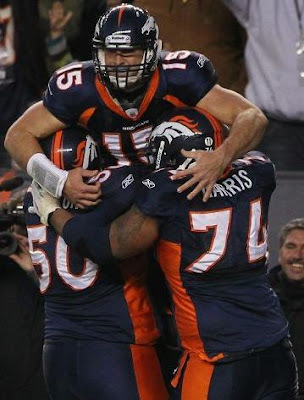 Except when I remember that the Broncos are as pathetic as possible, at which point I long for the offseason already. Anyway, here is how I have week 15 pegged. It's gotten to the point that kickers are making the Broncos look bad. Jay "Wheels" Feely trots into the end zone in a Cardinals rout of the Broncos. 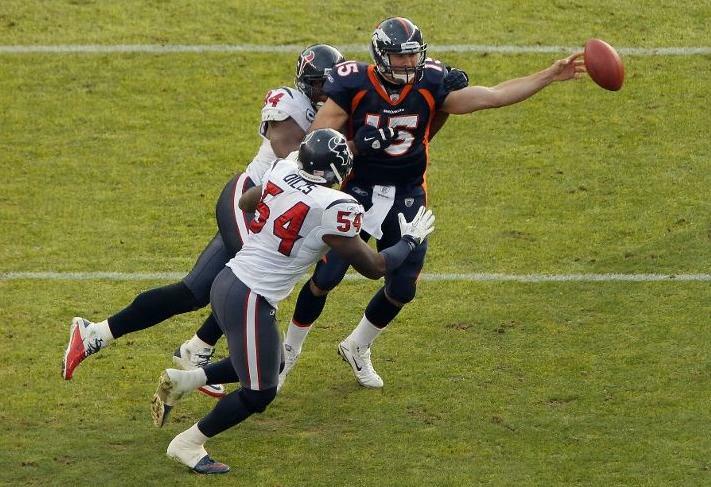 Rookie John Skelton out of Fordham acquitted himself well against the porous Broncos defense. This game felt more like a presason matchup, only there was apparently even less on the line. 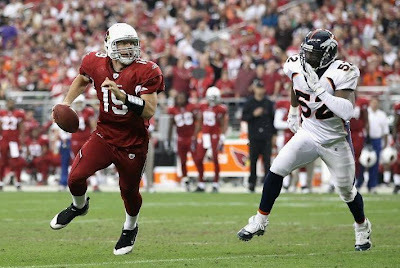 Adding to the preseason feel, the Cardinals even started John Skelton, a quarterback drafted in the fifth round who began the year as a 4th stringer. Then Skelton outplayed his counterpart Orton. 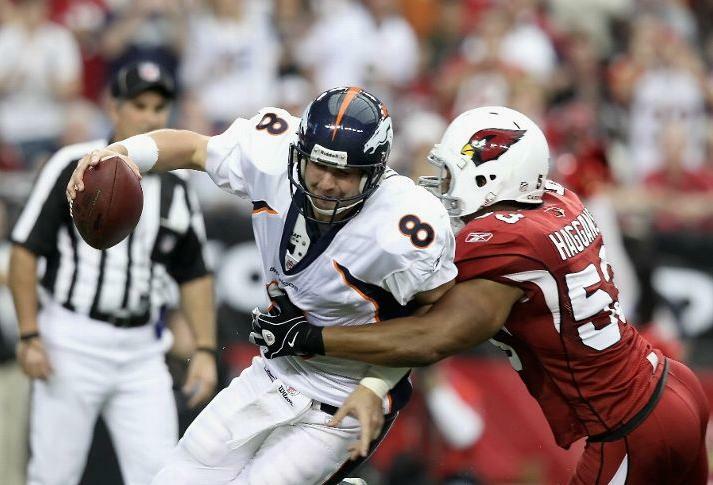 The Broncos came out against a dreadful team in Arizona and got blown out. Kyle Orton, one of the few brights spots of this overmatched and undertalented team, just gave up today. His heart wasn't in it, and neither was his head, and by the end he was just tossing up interceptions on a platter. The final pick which was returned for six had the look of someone who didn't care what happened to the ball he threw. Orton's aim was off, he was out of sync with the new playcaller Mike McCoy, and it just was a terrible day for the Broncos quarterback. The defense also played terribly, tackling poorly and generally looking completely lost on the field. When you're getting blasted by the Cardinals offense, you're clearly not giving it your best. The Broncos weren't getting beaten by the 1989 49ers out there, this was a team that had not scored a touchdown in 9 quarters before their kicker ran one in against the Broncos. If a running back blossoms on a 3-13 team, does anyone realize it? There were two bright spots in a sea of darkness. 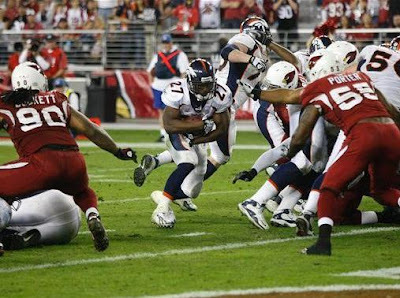 The first was running back Knowshon Moreno, who is blossoming into a legit NFL back on this team that the world has justly forgotten about. 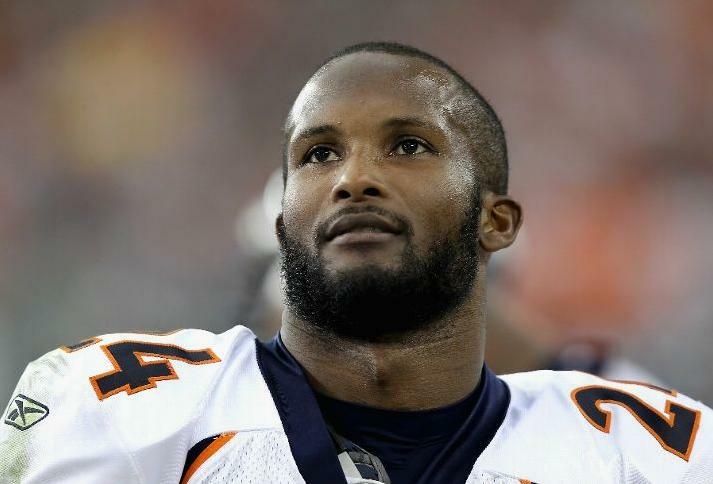 The second is Champ Bailey, the cornerback who is likely playing in his final weeks in Denver. Those two played well, the rest of this disaster played like a team that could not possibly care any less. 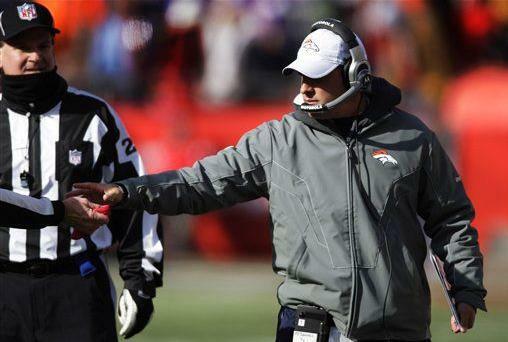 Puzzling to me is why the Broncos decided to not play Tim Tebow. The season is over, and they were getting blown out. I would have started him to find out what you have and at least put these final few games to some constructive purpose, but after falling way behind, what would be the shame in putting him in and letting him get a little experience? He really needs to get some playing time in these meaningless final few games, it makes zero sense to not at least let him face a few live rounds of action and see how he responds. Plus, it's about the only card the team can play to keep the fans interested, and there is zero buzz around this city for the Broncos right now. 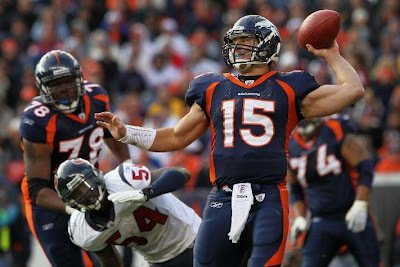 Hopefully they start Tebow next week in Oakland, Seriously, why not at this point? Thanks for the memories, Champ. You're a class act. So, the city of Denver is left with a football team that doesn't appear interested in competing, and really...it might be for the best. Losing the remaining games can only help with draft positioning, and really, would anyone in Orange feel better about 6-10 as opposed to 3-13? I'm not used to having a month left in the season and having it not matter at all. Lack of hope is hard to take as a football fan. 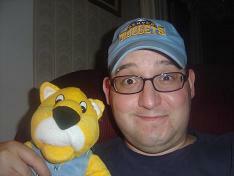 I'm still a Broncos fan, of course, but let's just say I'm not sticking my chest out about it these days. Craig was slightly irritated at the Christmas shoppers, but still found joy in his heart owing to the fact that Josh McDaniels has been shipped out of Denver. Also, A big decision is announced, as Craig has been mulling fantasy football retirement for weeks and he used Episode Ocho Cinco to declare his intentions. Craig, Face and The Whale also discuss the benefits of not being self-aware. Finally, we do a little navel gazing by announcing the Magnificent Seven best VSR intros of all time. It's a walk down memory lane, including the return of one of the most beloved Fake radio intros of all time which makes us miss our buddy MJ. 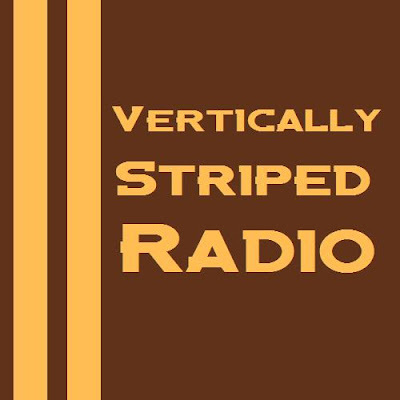 The Vertically Striped Music recommendation was "Happy Kid" by Nada Surf. Ding Dong, the Witch is Dead!!! 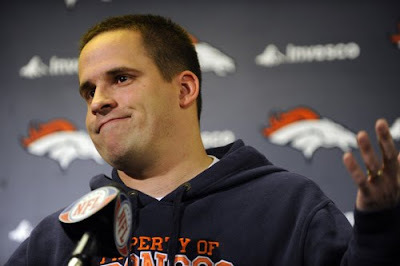 McDaniels is fired in Denver! And there was much rejoicing! Don't go away angry, Josh. Just go away. McDaniels fired! Not the news I was expecting to hear tonight, but I can't wipe the smile off of my face. 11-17 and the worst personnel decisions on record are no longer in charge of the organization. 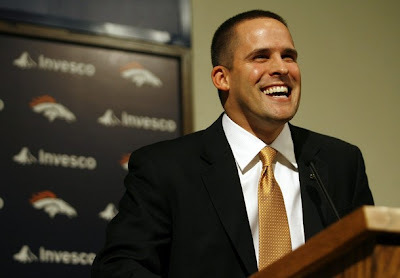 Clearly, he has left Denver in shambles, and it'll take us some time to try and pick up the pieces, but the arrogant man who refused to listen to others, who made baffling decisions both on and off the field, and who was indicted in his very own Spygate scandal. Quite the legacy. The Belichick coaching tree is diseased, apparently. Hopefully the Broncos and Pat Bowlen will be wise enough to avoid the New England family this time. So long as we don't bring in Brad Childress or Wade Phillips, I see this change as a positive. The final straw was finding out that Belichick Jr. was following the lead of his mentor even when it came to cheating. That whole video taping scandal in London was made all the worse by the fact that in addition to hurting the honor of our proud franchise, he still was losing. So now we have four games to muddle through this random interim period. Someone named Eric Studesville, the running backs coach, has been elected to run things for the next few weeks. Seems random, but how much worse could he possibly do? Perhaps he'll even benefit from the interim bounce that the Vikings and Cowboys have enjoyed. It doesn't hurt than their next game is against the Cardinals. I don't see a win streak of more than one game, if we even get that, but I don't care. The highlight of this lost season is that McD is McDone! 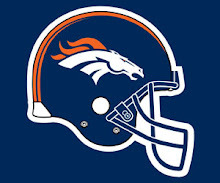 Viva los Broncos! I am almost as happy as he looks. Except that my team is a burning pile right now thanks to him. What a difference three weeks make. When last we saw these two teams on the field they combined to score 78 points in a Broncos runaway win and Todd Haley refused to shake Josh McDaniels hand. 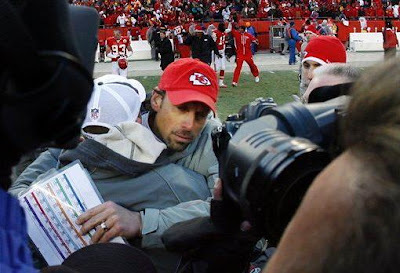 On Sunday, the two teams combined for a whopping 16 points, and Todd Haley gave Joshie a big hug. What a farce. Can you say overcompensating? Although I really don’t want him as my coach anymore, I will give Josh McDaniels this: He excels and finding new and interesting ways to lose games. This week, rather than his usual successful passing game with no running game and a defense that tries to chase it’s opponents from behind as they routinely break off huge plays, he mixed it up. The defense was stout, the running game excelled, and the Broncos completely failed at passing and scoring. 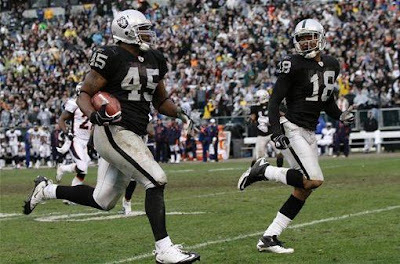 Then, at the end, when a victory was possible, he totally abandoned the tremendous run game and kept Kyle Orton throwing despite the fact that the passing game had proven worthless all day and then punted despite being down only 4 points and needing only a few yards for a first down and there were less than three minutes to go. I guess I have to hand it to him, because he got the ball back with fifteen seconds from his own 8, so his strategy worked gangbusters. Quite the innovator, that McDaniels; Jason Whitlock tweeted out after the game that McDaniels is in totally over his head, and I couldn’t agree more. In a game that was totally winnable for the Broncos, they refused to open it up and take chances, and the result was a forgettable loss to a team that now holds a two game advantage in the AFC West. (By the way, with the Chiefs…Yes, they will almost certainly win their division barring a complete collapse against an easy schedule, but bet heavily against them in the playoffs. It’s free money) The Broncos loss was not unexpected at this point, they lose almost every week anymore. And it wasn’t even that disappointing, as it’s probably better for the Broncos to get a good draft pick by losing. It was just kind of sad. This season is over, and there isn’t much reason to care for the final quarter of the year. Knowshon Moreno: The Georgia product finally lived up to his potential that caused him to be picked in the first round last year. He was punishing opponents and making things happen as he broke big play after big play and also gained the tough yards. The Broncos might have won the game had they stuck with the run game instead of going almost exclusively with the subpar passing game the final few drives. 161 yards on 23 carries is a great day. 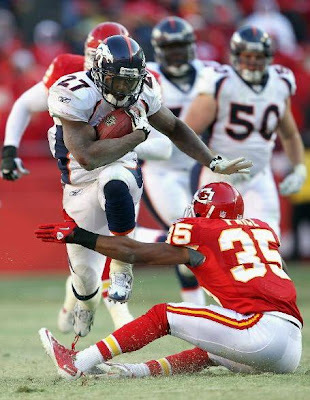 Champ Bailey: Dude was a beast making some glorious tackles and plays, and even getting a sack. 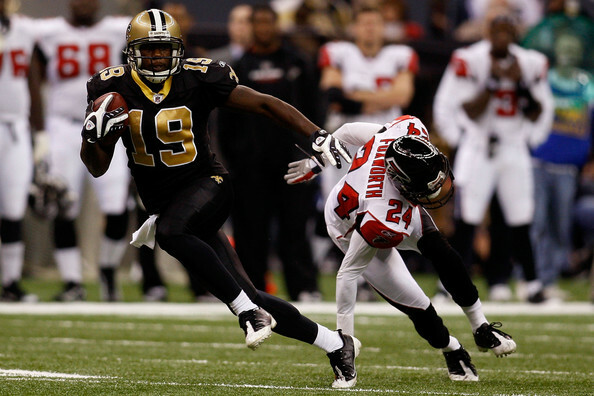 Makes me sad that this great player is spending his twilight NFL years laboring for such a crappy team. 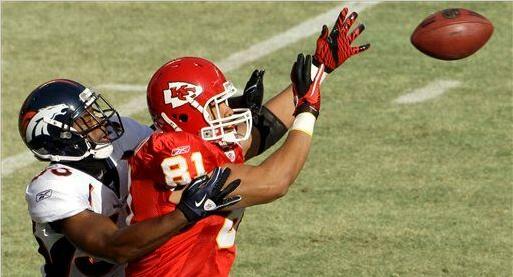 The Defense: Made a big goal line stand, and held the Chiefs to a miserly 10 points on offense. The Broncos didn’t lose the game on the defensive side of the ball. You hold a team to ten points, you need to win. Especially when you scored 49 points against them the last time you played. Kyle Orton: Nine completions on twenty-eight attempts. 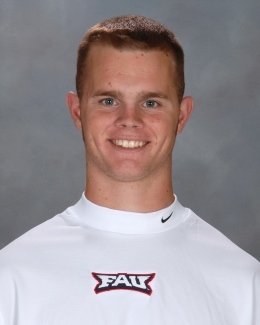 A quarterback rating of 46.3, and an average yards per pass of 4.2. You can’t win with stats like that. Orton has been very good this season, but he looked out of his depth and completely hopeless all day. His accuracy was atrocious, and on top of that, he lost a critical fumble late in the game. 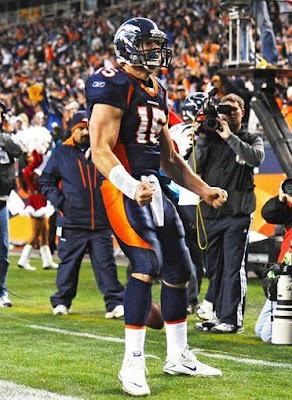 Definitely his worst game of the season, and possibly his worst game as a Bronco. Josh McDaniels: Challenging a 9 yard gain in the first quarter, even if you’re correct, is dumb with the limited nature of the rules instant replay challenges. Then not challenging a potential fumble when your team picks it up and runs it inside the 10 is a big time head-scratcher. 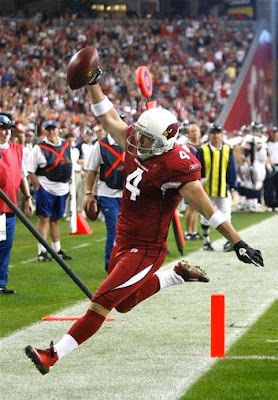 But the worst thing he did on the day was punting the ball on 4th and 4 from his own 44 with less than 3 minutes left. You have to go for the 4th down conversion there, you just HAVE to. There isn’t much time left, so even if everything goes perfectly with you punting, you will get the ball back with less than a minute deep in your own territory. The Broncos had 2 timeouts left, so no matter what happened, they needed to stop the Chiefs from getting a first down, and even if the Chiefs stop you and then kick a field goal, you’re still within one score. If you pick up the fourth down, you still have time so that you don’t have to hurry, and you have the ball in a good spot. McDaniels meekly calling for a punt in that scenario was the worst thing he could have done. The Chiefs could not be less impressive to me. 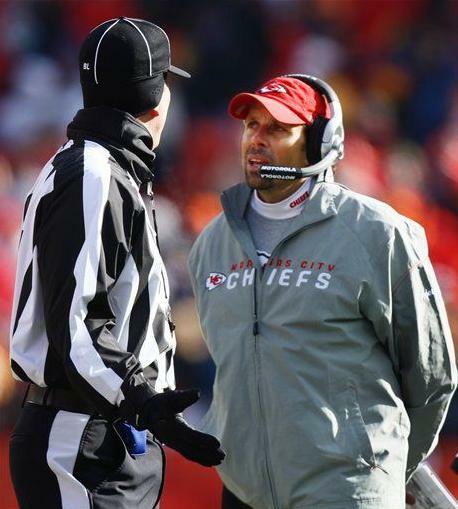 Todd Haley seems like a rabid dog on the sideline, he’s the kind of coach that I’m certain that NFL refs dread having to work with. He just complains about everything and yells and just gets under your skin. He got under MY skin as I was watching on television, and I didn’t even hear what he was saying. 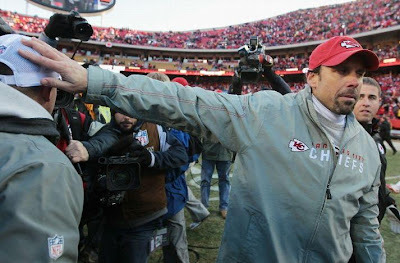 I just dislike that guy, and his fake overcompensating hug of McDaniels was just ridiculous. I don’t care about him offending the honor of McDaniels, as I want that guy ridden out of town on a rail; but just the general douchiness of Haley rubs me the wrong way. Between him in Kansas City and Phil Rivers in San Diego, it’s getting to the point where the least objectionable team in the AFC West to me is the Raiders. Egads. As for the Broncos, I still want them to win games as I watch them, but in retrospect, I’m rather glad they dropped that one. Winning it would have just hurt their draft placement. I feel like the Broncos get one more win. (Next week in Arizona, if you’re curious.) 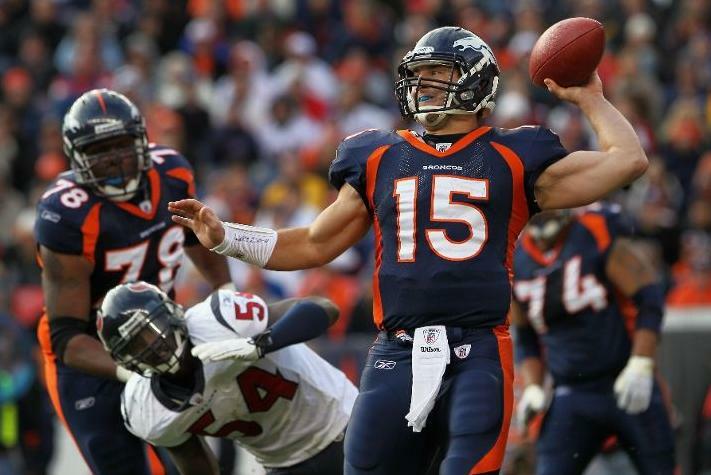 Possibly two if they can overachieve at home the day after Christmas against a lukewarm Houston Texans team, but right now, the best case scenario for the Broncos is a 5-11 season. Hopefully the offseason goes better than this wretched season has. 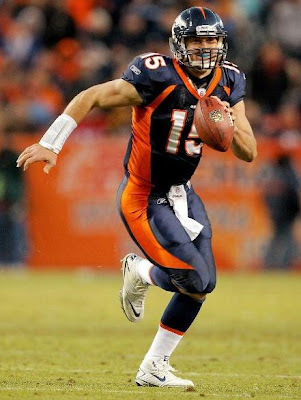 Only a month more, Broncos fans, then we can begin our Fire Joshie vigil! Go Broncos! 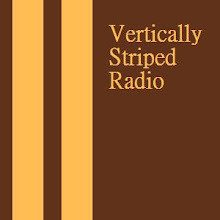 Vertically Striped Radio - Episode 84 - 12-04-10 - Someone stole my snowman! After a snowman themed newscast, Face, The Whale, and Craig break down the Derek Anderson post-Monday Night Football press conference melt-down. I say leave Derek alone, he's allowed to laugh on the sidelines. That morphed into a discussion about, what else, Lebron James and the Cleveland fan experience. I am pro-Cleveland fan, by the way. 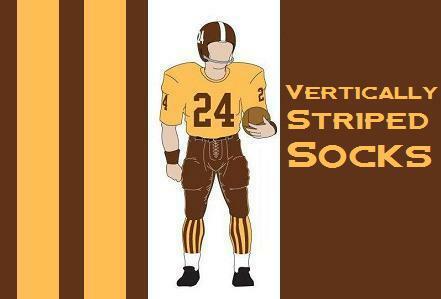 After the sports discussion, we went into "fashion" speak with the Magnificent Seven NFL Throwback Uniforms. Our third installment of the He-Man woman haters club had us discussing the Redford-Newman classic "The Sting" and the ridiculously prolific career of "That Guy" Dana Alcar. The music recommendation was from Caspar Babypants a brilliant kids artist and former member of "The Presidents of the United States of America" as we recommended the songs "9.99" and "Googly Eyes." I think it's safe to say Monday Night's game is big. I'm coming off my best weekend of the season, going 13-3 in my picks. Now that I'm getting cocky, I'm due for a craptastic week, probably, but I don't care. The NFL is getting REALLY good. Between Bills receivers blaming God for dropping footballs and terrible quarterbacks freaking out in Arizona demanding that they are NOT finding anything funny. It's been a good week in the NFL, and we have a spectacular slate on Sunday...unfortunately we also have Panthers versus Seahawks, so they can't ALL be winners. Ah well, here are my big guesses for this weekend's slate of action. Mike Vick led the Eagles to a big victory over the Texans on Thursday. Hey Maw! Look at me, I is an NFL quarterback! Aw, Shucks! 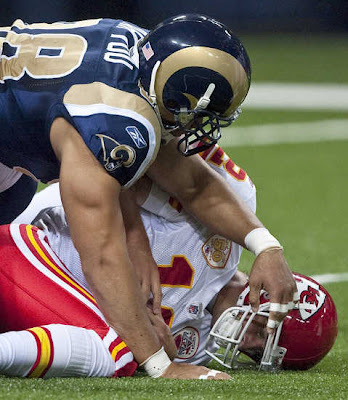 Rams at Cardinals – The Cards stink, but it’s nice to know they put their heart and soul into this every week.